Welcome to Marvel Strike Force Heroes page. This is the full description of MSF Groot stats, skills and abilities. Groot is a Guardian Supporter who heals and buffs his allies. His first skill hits the enemy for a medium amount of damage. With his second skill, Groot applies Deathproof and Defense Up on 4 allies with the lowest Health. Groot ultimate heals allies for a medium amount of Health, clears all negative effects from all in his team and grants immunity to the Guardian ally with the lowest Health. Passive ability grants him a 10% chance for reviving with 10% of his Health and buffs allies with Defense Up when Groot dies. If his allies are Guardians they receive Defense Up, Speed Up, Offense Up and Counter upon Groot's death. Additionally, anyone who strikes Groot has a chance (always on passive level 5) to be affected with Slow for 2 turns. Groot is a very useful hero when he is with Guardians and he should not be underestimated. After the 2.3.0 update, he is considerably stronger, becoming a vital part of the Guardians team. Groot price is 100 shards obtainable through Mega Orbs, Premium Orbs, and 2.9 Nexus campaign mission. Heal 3 lowest health allies for 200 Health + 5% of this character's Max Health. Clear 2 negative effects from all allies. On Death, 10% chance to Revive with 10% of this character's Max Health. On Death, apply Deathproof on Rocket Raccoon if ally. 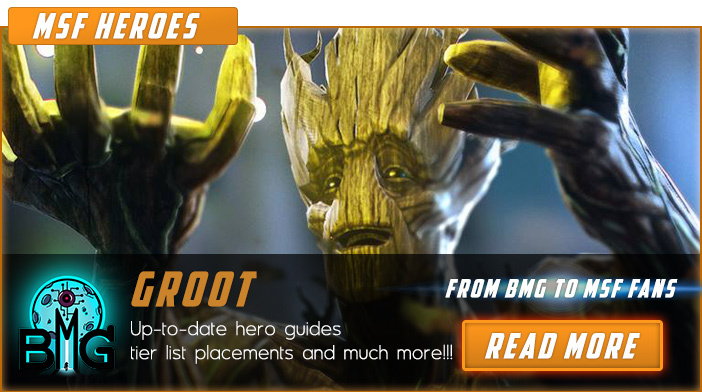 We hope that you enjoyed the description of MSF Hero Groot. For detailed information about other MSF Characters check our MSF Heroes page.